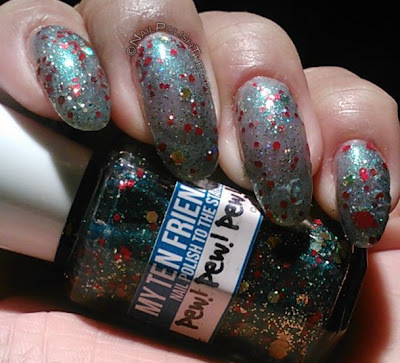 Beranda » MyTenFriends » Nail Art » Nail Polish » My Ten Friends: Pew! Pew! Pew! My Ten Friends: Pew! Pew! Pew! My Ten Friends: Pew! Pew! Pew!, I have another creation from My Ten Friends for you and this one is called Pew! Pew! Pew! The name alone had me intrigued and when I saw it on the site I had to add it to my order. 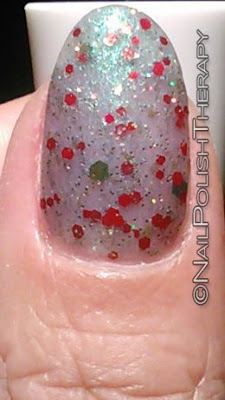 Just like Dirtball this polish had a great combination of colors that I love and it was very easy to apply. I picked it because it looked like something you could wear for Christmas or any other time of the year since the base is not very dense. I applied 3 thick coats to my nails and they were not as opaque as Dirtball when applied in 2. I probably will put it on top of a black or teal color next time to showcase the color better, but I wanted to show it alone. The great thing about this color was that you didn't have to fish for the glitter. Each stroke had enough glitter and a variety of shapes as well. Even after 3 thick coats of application the polish did not get gloopy in the bottle and stayed in it's original moving form. I added 1 coat of Seche Vete as a top coat and even with 3 coats this dried pretty fast and smooth and didn't eat the top coat. Once again My Ten Friends has impressed me. What are your thoughts? feelings? concerns?